Tula Pink Self Healing 24x36 Cutting Mat. Premium Cutting Mat made from PVC vinyl with a solid plastic core is made to last. It's self healing technology allows for quick recovery of cuts from rotary blades all while extending the life of your blades with its safe working surface. 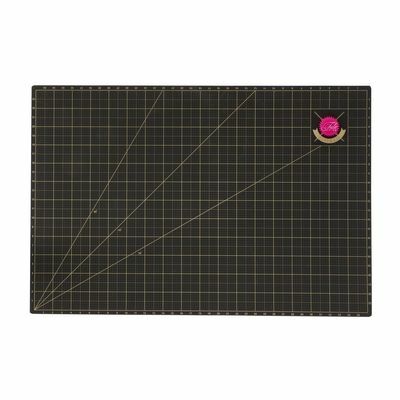 This mat offer reversible cutting surfaces; gold guidelines available when measuring is required and a solid black surface when it's not. Store flat. **This item is subject to a Minimum Advertised Pricing Policy $54.99. Full Brewer MAP policy details are available for review on our website under the Shop Resource tab. ** **Freight Intensive** Billable transportation charges for freight intensive items will be the greater of the dimensional weight compared to the actual weight. In addition to transportation charges, freight carriers may assess an additional oversize charge per package.